TYPE: STSP Weekly | PACE: Conversational | TERRAIN: Mostly sidewalk, some grass/dirt trail, some road | DISTANCE: Approx. 3 mi | Walk Description: Returning for its fourth year, but now on Thursdays, it's the Stapleton Sunrise walk. We will meet at the same location every week, and we'll journey around the Northfield neighborhoods, exploring the various parks, trails, and secret spots of Stapleton's newest neighborhoods. Come get to know your neighbors or the neighborhood. Walking Movement Leader: Join our two co-leaders, Chris Englert, founding member-owner of Walk2Connect co-op is known as Denver's Urban Hiker. (http://urbanhikingden.com) She leads walks within Denver's C470 loop and is author of The Best Urban Hikes: Denver (http://amzn.to/2wF0ZKC). Walking around Denver gets enthusiasts ready for her global walking vacations, which you can find details at www.EatWalkLearn.com. 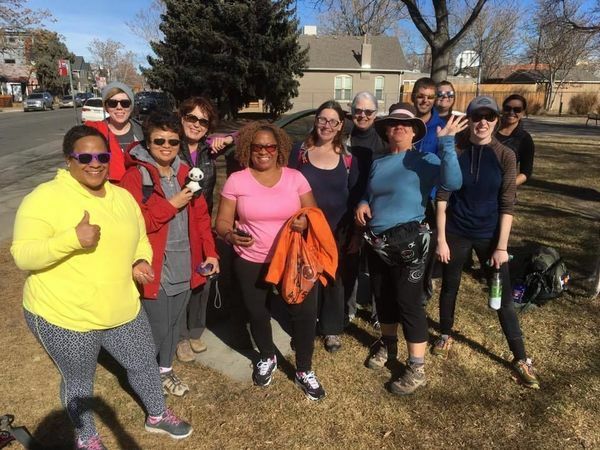 Come chat, walk, and connect with Chris as she gifts this walk to you weekly in Stapleton. Lee DeBois moved to Stapleton from New York a few years ago and has loved getting out and exploring Stapleton and Denver. She invites you to say hello, make friends, and walk! Schedule, Planning: We will meet at 8:00 am at the corner of Uinta and 51st Ave next to the playground. . Please park along the street and meet in the park. Do not disturb the residents. There are currently no facilities here, although restrooms are being installed to open in late 2017.. We leave NO LATER than 8:05 am. We should be done walking no later than 9:10 am. You can of course leave early if you need. Trip Notes: – Dogs are allowed on this one. Please be sure they are well-behaved and on a short leash. No retractable leashes please. – Accessibility: If you’re on a stroller or wheelchair, keep in mind the sidewalks are cracked and bumpy. We can adapt the route so you are with our group on quieter neighborhood streets. – Wear/Bring: comfortable socks & clothing (pref. non-cotton! ), light backpack for snacks and water, gloves/scarf, head cap if cool outside, and sunglasses/sunscreen. – Restrooms are not available. See above. – Cancellation Policy: We only cancel in extreme weather conditions on our path, such as ice, hail, or lightening. Check Meetup or text the walk leader for the most up-to-date conditions. Welcome Waivers: Please fill out the online “Welcome Waiver” (http://walk2connect.com/welcomewaiver/) or download, print, sign, and turn in a hard copy if this will be your first Walk2Connect walking experience in 2017. RSVP: You register for this walk by RSVP'ing here or by emailing Lee at [masked] *** Get Involved! 1. Sign-up for weekly Walk2Connect emails here (http://eepurl.com/XPdKH) 2. Keep checking our main event calendar here (http://www.walk2connect.com/events) 3. Follow us on Facebook here (http://www.facebook.com/walk2connect) 4. Become a Life@3MPH Champion here (http://walk2connect.com/community/champions/) 5. Learn more about leading walks in your area by becoming a Walking Movement Leader here (http://walk2connect.com/community/walkingmovementleaders/) Connect with our social media community ~ @Walk2Connect | #Lifeat3MPH Follow Chris at @urbahikingDEN for all things Denver, or @eatwalklearn for global walking adventures. TYPE: STSP Weekly | PACE: Conversational | TERRAIN: 50% sidewalk / 50% grass and dirt trail | DISTANCE: Approx. 4 mi | TIME: 2 hours | COST: Free Didn’t you always love having a casual easy-goin’ Sunday morning that included a good old fashioned diner? We’re going to recreate the Sunday stroll with a 4-mile mosey circling through the 5 parks of Glendale, and finishing with a great Sunday brunch at Caitlin’s Diner. Of course the brunch is optional – but I know I’LL always be there! All doggies are welcome – even at Caitlin’s! Yes, doggie’s are welcome on their deck so they’ve welcomed our furry friends. This walk will also be baby stroller friendly. This walk is relaxed, casual, and fun as we explore the parks, pathways – even pancakes — of Glendale! Your Trip Host: Award Winning Author of 3MPH: Adventures of One Woman’s Walk Around the World, Polly Letofsky! Caitlin’s Address: 4379 E. Mississippi Ave, Glendale, CO 80246 (On Mississippi just 2 blocks east of Colorado Blvd.) Parking: There will be plenty of parking in the Caitlin’s parking lot. This walk is super duper duper doggie friendly! We will be doing a loop going back to our starting location. (Please be sure you are confident your dog can handle 3-4 miles and cooler temps when walking in fall and winter and insure that your dog is calm, well behaved and MUST stay leashed. Please be sure to bring baggies.) Welcome Waivers: Please fill out the online “Welcome Waiver” (http://www.walk2connect.com/welcomewaiver) or download, print, sign, and turn in a hard copy if this will be your first Walk2Connect walking experience. Breaks, Restrooms: Until summer officially begins we won’t be passing any restroom, so be sure to use the restroom before you leave home OR before the walk at Caitlin’s. Consider Bringing: – Comfortable socks & shoes (pref. non-cotton socks) – Light backpack with water and snack foods (almonds, bars, fruit) – Gloves, scarf, beanie – Camera – Sunglasses & Sunscreen (and hat if you wear them) – Bring many (thinner) layers depending on anticipated temperature and light rain gear just in case.